While summer is coming to an end, it’s not too late to enjoy some fantastic online casino summer promotions. 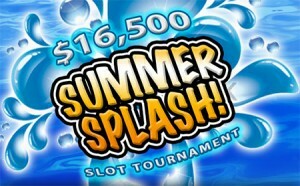 Customers at Omni Casino have another week to enjoy the exclusive $16,500 Summer Splash Slot Tournament. The Summer Splash Slot Tournament at Omni Casino gives you the chance to win up to $16,500. Summer Splash is a multi-level tournament that is suitable for all ranges of budgets. Regardless of whether you have a low budget or are amongst the highest of rollers, you have a great chance to win some extra cash. You will be automatically entered when you play slots at Omni Casino, for each spin of $0.5 or higher on any 15-50 line slot game, you will earn one tournament spin point. Players compete to see who has the highest average bet range for the tournament and every Monday, Wednesday and Friday a leaderboard is published. With each leaderboard update Omni Casino is awarding a special 450 beach ball prize, the ball will randomly land on one player’s rung. Furthermore, players who spin past 115,000 points or 14,000 points for the entire tournament will win a $200 or $450 prize booster. If you haven’t checked out the fantastic slot collection at Omni Casino then sign up today and you could win some bonus summer cash.